Robert Merton Solow (/ˈsoʊloʊ/; born August 23, 1924) is an American economist, particularly known for his work on the theory of economic growth that culminated in the exogenous growth model named after him. He was awarded the John Bates Clark Medal in 1961, the Nobel Memorial Prize in Economic Sciences in 1987, and the Presidential Medal of Freedom in 2014. 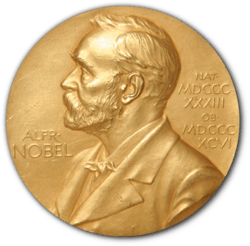 Three of his PhD students (Akerlof and Stiglitz, Diamond) became recipient for the Nobel Prize by themself. Robert Solow was born in Brooklyn, New York, into a Jewish family on August 23, 1924, the oldest of three children. He was well educated in the neighborhood public schools and excelled academically early in life. In September 1940, Solow went to Harvard College with a scholarship at the age of 16. At Harvard, his first studies were in sociology and anthropology as well as elementary economics. By the end of 1942, Solow left the university and joined the U.S. Army. He served briefly in North Africa and Sicily, and later served in Italy during World War II until he was discharged in August 1945. He returned to Harvard in 1945, and studied under Wassily Leontief. As his research assistant he produced the first set of capital-coefficients for the input–output model. Then he became interested in statistics and probability models. From 1949–50, he spent a fellowship year at Columbia University to study statistics more intensively. During that year he was also working on his Ph.D. thesis, an exploratory attempt to model changes in the size distribution of wage income using interacting Markov processes for employment-unemployment and wage rates. In 1949, just before going off to Columbia he was offered and accepted an Assistant Professorship in the Economics Department at Massachusetts Institute of Technology. At M.I.T. he taught courses in statistics and econometrics. Solow's interest gradually changed to macroeconomics. For almost 40 years, Solow and Paul Samuelson worked together on many landmark theories: von Neumann growth theory (1953), theory of capital (1956), linear programming (1958) and the Phillips curve (1960). Solow also held several government positions, including senior economist for the Council of Economic Advisers (1961–62) and member of the President's Commission on Income Maintenance (1968–70). His studies focused mainly in the fields of employment and growth policies, and the theory of capital. 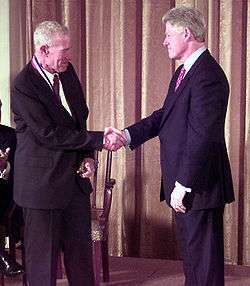 In 1961 he won the American Economic Association's John Bates Clark Award, given to the best economist under age forty. In 1979 he served as president of that association. In 1987, he won the Nobel Prize for his analysis of economic growth and in 1999, he received the National Medal of Science. In 2011, he received an honorary degree in Doctor of Science from Tufts University. Solow is Founder of the Cournot Foundation and the Cournot Centre. After the death of his colleague Franco Modigliani, Solow accepted an appointment as new Chairman of the I.S.E.O Institute, an Italian nonprofit cultural association which organizes international conferences and summer schools. He is a trustee of the Economists for Peace and Security. Solow's past students include 2010 Nobel Prize winner Peter Diamond, as well as Michael Rothschild, Halbert White, Charlie Bean, Michael Woodford, and Harvey Wagner. He is ranked 23rd among economists on RePEc in terms of the strength of economists who have studied under him. Solow's model of economic growth, often known as the Solow-Swan neo-classical growth model as the model was independently discovered by Trevor W. Swan and published in "The Economic Record" in 1956, allows the determinants of economic growth to be separated into increases in inputs (labour and capital) and technical progress. Using his model, Solow (1957) calculated that about four-fifths of the growth in US output per worker was attributable to technical progress. Solow also was the first to develop a growth model with different vintages of capital. The idea behind Solow's vintage capital growth model is that new capital is more valuable than old (vintage) capital because new capital is produced through known technology. Within the confines of Solow's model, this known technology is assumed to be constantly improving. Consequently, the products of this technology (the new capital) are expected to be more productive as well as more valuable. The idea lay dormant for some time perhaps because Dale W. Jorgenson (1966) argued that it was observationally equivalent with disembodied technological progress, as advanced earlier in Solow (1957). It was successfully pushed forward in subsequent research by Jeremy Greenwood, Zvi Hercowitz and Per Krusell (1997), who argued that the secular decline in capital goods prices could be used to measure embodied technological progress. They labeled the notion investment-specific technological progress. Solow (2001) approved. Both Paul Romer and Robert Lucas, Jr. subsequently developed alternatives to Solow's neo-classical growth model. Since Solow's initial work in the 1950s, many more sophisticated models of economic growth have been proposed, leading to varying conclusions about the causes of economic growth. In the 1980s efforts have focused on the role of technological progress in the economy, leading to the development of endogenous growth theory (or new growth theory). Today, economists use Solow's sources-of-growth accounting to estimate the separate effects on economic growth of technological change, capital, and labor. Solow currently is an emeritus Institute Professor in the MIT economics department, and previously taught at Columbia University. In the early 1960s the Massachusetts Institute of Technology (MIT) was the native land of the “growthmen.” Its leading light, Paul Samuelson, had published a pathbreaking undergraduate textbook, Economics: An Introductory Analysis. In the sixth edition of Economics, Samuelson (1964) added a “new chapter on the theory of growth.” Samuelson drew on the work on growth theory of his younger colleague Robert Solow (1956)—an indication that growthmanship was taking an analytical turn. The MIT economists were thus growthmen in two senses: in seeing growth as an absolutely central policy imperative and in seeing the theory of growth as a focus for economic research. What the MIT growthmen added was a distinctive style of analysis that made it easier to address the dominant policy concerns in tractable formal models. Solow’s (1956) model was the perfect exemplar of the MIT style. It provided the central framework for the subsequent developments in growth theory and secured MIT as the center of the universe in the golden age of growth theory in the 1960s (Boianovsky and Hoover 199–200). Solow, Robert M.; Dorfman, Robert; Samuelson, Paul (1958). Linear programming and economic analysis. New York: McGraw-Hill. Solow, Robert M.; Galbraith, John Kenneth (1967). The new industrial state or son of affluence. Indianapolis: Bobbs-Merrill. Solow, Robert M. (1960), "Investment and technical progress", in Arrow, Kenneth J.; Karlin, Samuel; Suppes, Patrick, Mathematical models in the social sciences, 1959: Proceedings of the first Stanford symposium, Stanford mathematical studies in the social sciences, IV, Stanford, California: Stanford University Press, pp. 89–104, ISBN 9780804700214. Solow, Robert M. (2001), "After technical progress and the aggregate production function", in Hulten, Charles R.; Dean, Edwin R.; Harper, Michael J., New developments in productivity analysis, Chicago, Illinois: University of Chicago Press, pp. 173–78, ISBN 9780226360645. Solow, Robert M. (2009), "Imposed environmental standards and international trade", in Kanbur, Ravi; Basu, Kaushik, Arguments for a better world: essays in honor of Amartya Sen | Volume II: Society, institutions and development, Oxford New York: Oxford University Press, pp. 411–24, ISBN 9780199239979. Solow, Robert M. (February 1956). "A contribution to the theory of economic growth". Quarterly Journal of Economics. Oxford Journals. 70 (1): 65–94. doi:10.2307/1884513. JSTOR 1884513. Pdf. Solow, Robert M. (1957). "Technical change and the aggregate production function". Review of Economics and Statistics. The MIT Press. 39 (3): 312–20. doi:10.2307/1926047. JSTOR 1926047. Pdf. Solow, Robert M. (May 1974). "The economics of resources or the resources of economics". The American Economic Review, special issue: Papers and Proceedings of the Eighty-sixth Annual Meeting of the American Economic Association. American Economic Association. 64 (2): 1–14. JSTOR 1816009. Solow, Robert M. (September 1997). "Georgescu-Roegen versus Solow/Stiglitz". Ecological Economics. ScienceDirect. 22 (3): 267–68. doi:10.1016/S0921-8009(97)00081-5. See also: Nicholas Georgescu-Roegen and Joseph Stiglitz. Solow, Robert M. (November 2003). "Lessons learned from U.S. welfare reform". Prisme. Cournot Centre for Economic Studies. 2. Solow, Robert M. (Spring 2007). "The last 50 years in growth theory and the next 10". Oxford Review of Economic Policy. Oxford Journals. 23 (1): 3–14. doi:10.1093/oxrep/grm004. ↑ Findlay, Ronald Edsel (1960), Essays on some theoretical aspects of economic growth. Ph.D. dissertation, Massachusetts Institute of Technology. ↑ A theory of endogenous technological change. ↑ Development planning in a dual economy. ↑ The short run demand for employment. ↑ Towards an economic theory of income distribution. 1 2 3 4 "Robert M. Solow – Autobiography". Nobelprize.org. 1924-08-23. Retrieved 2010-03-16. ↑ "RePEc Genealogy page for Robert M. Solow". Research Papers in Economics (RePEc). Retrieved 1 November 2014. ↑ "Top 5% Authors, as of September 2014: Strength of Students". Research Papers in Economics (RePEc). Retrieved 1 November 2014. 1 2 3 4 Haines, Joel D.; Sharif, Nawaz M. (2006). "A framework for managing the sophistication of the components of technology for global competition". Competitiveness Review. 16 (2): 106–21. doi:10.1108/cr.2006.16.2.106. ↑ Boianovsky, Mauro, and Kevin D. Hoover. "In The Kingdom Of Solovia: The Rise Of Growth Economics At MIT, 1956–70." History Of Political Economy 46. (2014): 198–228. Business Source Complete. Web. 24 Mar. 2016. Jeremy Greenwood, Per Krusell and Zvi Hercowitz, 1997, "Long-run Implications of Investment-Specific Technological Progress," American Economic Review, 87: 343-362. Jeremy Greenwood and Per Krusell, 2007, "Growth Accounting with Investment-Specific Technological Progress: A Discussion of Two Approaches", Journal of Monetary Economics, 54: 1300-1310. Robert Merton Solow (1924– ). The Concise Encyclopedia of Economics. Library of Economics and Liberty (2nd ed.). Liberty Fund. 2008.